in St st on larger needles; one 28-st cable panel = 3 3/4" wide. 5" wide and 68" long. -Finished Size: 5” wide and 68” long. -Yarn: Lion Brand Fishermen’s Wool (100% wool; 465 yd 425 m/8 oz 227 g): #098 natural, 1 ball. -Needles: Sizes 7 (4.5mm) and 8 (5 mm). Adjust needle size if necessary to obtain the correct gauge. -Notions: Markers (m); cable needle (cn); tapestry needle. 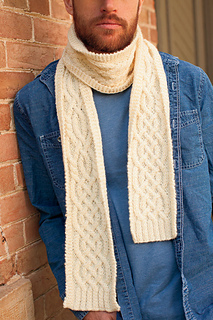 -Gauge: 19 sts and 22 rows = 4” in St st on larger needles; one 28-st cable panel = 3 3/4” wide. 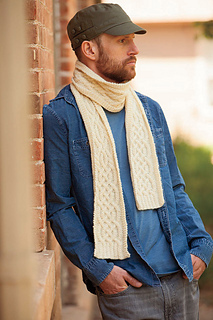 Narrow rectangular cabled and ribbed unisex scarf.